I've been wanting to try making mussels for a long time but have been put off because I did not really know what to do and thought I'd screw them up. Now I'm pretty sure they are virtually impossible to screw up! Not only are mussels always delicious when I have them in restaurants (and now at home!) but they are also a great seafood choice because growing them has a very low environmental impact, they actually clean the water while growing! 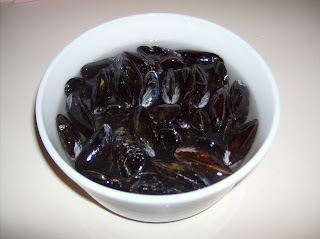 Mussels are also healthy and fairy inexpensive for seafood. I bough a bag of probably 50 mussels for $4.99. I read up on cleaning and debearding mussels before making them but honestly when I bought them at the store they were practically ready to roll. A few still had beards attached but a quick tug and they were gone. This YouTube video shows you how to clean and check the mussels. At one point, I was a little creeped out because I realized the mussles were still alive and found it a little disconcerting. However, they need to be alive or you don't want to cook and eat them. Still when I went to soak them in water it was weird to see little bubbles come up. The recipe I made can be found here. I followed the advice someone else left in the recipes comments about doubling the sauce and serving the mussels and sauce over pasta but honestly, I think it was a totally unnecessary thing to do. 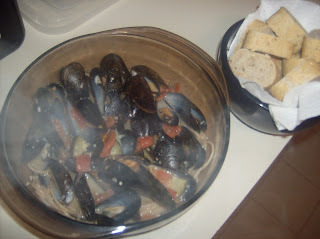 I was perfectly happy with the mussels and some bread to dip in the sauce. You'll want a crusty bread. I used a multi-grain baguette. You have convinced me to try this dish. Mussels are well known for having high marks in terms of sustainability. They are cultivated worldwide and thrive in most aquaculture settings.